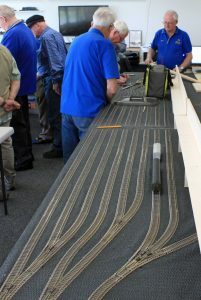 “Charlestown” – a HO scale childrens U-drive layout for exhibitions and displays. The primary reason for building the layout was to give members who do not have a layout or test track at home somewhere to run trains, test locos and rolling stock, etc. It is also useful to enable members to learn new skills, such as track laying, electronics and scenery. The under frames are constructed of welded 25mm steel tube, which supports an overlaying plywood base board. The overall size is approximately 8m x 2m. The layout has two levels, as you can see in the photographs. Tracks are Peco 100 gauge and Peco turnouts have been used throughout with Circutron Tortoise point motors. The track plan is a series of simple interconnected loops on the lower level, leading up to a yard and round house on the top level. There are also a number of industrial sidings around the layout. The control and track power is provided by a NCE DCC system using radio control. The track plan also includes a large discrete DC circuit for owners of DC locomotives. This track has its own fiddle yard and control system. While Baldwin Park was not originally designed for operations, some members are currently investigating the possibilities and are developing operating serials. Thanks to the efforts of a crew of members the scenery is almost completed, but of course there are always improvements to be made. The current CMRCI layout (named Petersville because of the number of our Members who bear that prestigious name) was first displayed at the 2014 Malkara exhibition and has since appeared at the Canberra, Wagga Wagga, Bungendore and Albury shows. It won the Ladies Choice Award at Wagga in 2015 and Best In Show in 2017 as well as Best In Show at Albury in 2018. “Petersville” is an HO scale layout designed to provide maximum action at any exhibition. It is based on a coal mine with a small town nearby. Rail traffic consists of block coal trains, plus interstate traffic on the main line nearby – mainly containers, wheat and passenger traffic. There is be plenty of shunting action at the Terrytown Yard and associated with the coal mine. Petersville does not have a fiddle yard as such. The layout is designed so that the audience can view it from all sides. Control is from several points around the layout. The control system is DCC radio control, with points controlled by macros. This system was also used on our previous exhibition layout, and it works very well. The layout is composed of 6 modules, each 1.8m x 1.2m. Each module will fit into the Club trailer and the complete layout and all ancillary equipment can be easily carried in one load. The layout sits on a 25mm steel base with a 6mm baseboard. In 2018 the decision was made to build a new layout to replace Petersvile. It has had a busy life and is showing signs of age. Construction of the underlying structure and baseboard for the new layout. is compete and tracklaying is well underway. The layout will also feature moving boats, bicycles and vehicles. Charlestown is a simple layout designed specifically for Children. It has four independent tracks on two levels with four controllers, one on each corner. That way, four children can individually “drive” their own train – usually flat out! The layout is very popular with children and is frequently operated at venues such as the Hall Markets, Bunnings, retirement homes, etc. Apart from providing entertainment, the layout is used as a means to promote our annual exhibition. It usually has a very busy schedule in the December – March period. The control system is DC. The track is HO gauge and the locomotives and rolling stock are mainly Thomas The Tank Engine and Friends. Construction of the layout was mostly done by the Daylighters group which meets on a Tuesday morning. The baseboard is 25mm tubular steel underframe with a 9mm baseboard on top. It is constructed in two sections, each 1.2m x 1.8m providing a total surface size of 3.6m x 1.2m. The scenery is mounted on polystyrene covered with plaster bandages. It has proven to be a stable resilient surface that can support structures, features and ground cover. 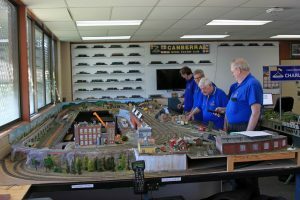 The layout had its first outing at the 2018 Canberra Model Railway Club Expo in March 2018, It was officially launched by Mrs Janet Schuster and Ms Suzanne Orr MLA, Member for Yerrabi. Ms Orr was a member of the ACT Government panel that awarded the grant that enabled the construction of Charlestown. The funding to build the display was provided by a grant under the 2016-2017 Participation (Veterans and Seniors) Grant Scheme. The layout features and English style village – in deference to Thomas – and the Jurassic Zoo which has many dinosaurs in residence. 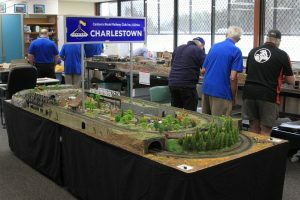 The layout was named Charlestown in honour of our late Life Member Mr Charles Schuster..